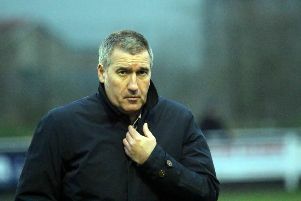 Forget the home form, says Banbury United boss Mike Ford as he works out how he can get his side to start picking up wins on the road. The Puritans have won their last five Evo-Stik League South games at the Banbury Plant Hire Community Stadium but have lost their last three as the visitors and have not picked up three away points since September. I’ve looked at our away records and, since our win at Bedworth in September, we’ve played 11 games in all competitions and we’ve not won one of them! Ford said: “I don’t want to talk about home form because it’s not a consideration for me. I’ve looked at our away records and, since our win at Bedworth in September, we’ve played 11 games in all competitions and we’ve not won one of them! That has to change. “For the past couple of seasons, we’ve gone away from home with the mentality of not losing and we ended up winning a lot of games through that approach. “This season, we’ve been going to teams with the aim of winning, especially with our fire-power, and it’s not working out. “You’re given 42 points at the start of the season and, away from home, we’re not looking after 21 of them. Jack Harding returned to the side against Coalville Town, his first game since October, in place of the unavailable Manny Agboola, and came through fine. Lee Henderson also returned but Ford will see how the former Oxford City defender trains this week before deciding his line-up for Saturday’s trip to AFC Rushden & Diamonds. Ford added: “Jack [Harding] is fine but I’m just waiting on Manny Agboola and Matt Taylor to see if they are available. But I’ve got to make sure Lee Henderson is ready for Saturday’s game. “From my experience, you play on adrenaline in your first game back from a long injury and the second game is always more difficult. “Ricky Johnson came off with a sore Achilles against Coalville but if he’s not fit for Saturday then I’ve got Steve Diggin ready to come back in.